Meet POPPY. 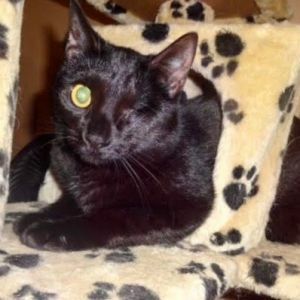 She is a 1 year old STUNNING all black female kitty that is extra special because she has one eye. Poppy had a bad eye infection as a kitten and ultimately needed her eye removed. But it does not affect her at all and just makes her that much more adorable. Poppy and her sister Sissy had been living in a local shelter since they were kittens, but presently Poppy is being fostered and learning what it’s like to be loved in a nice foster home. Poppy enjoys full body PETTING and even belly rubs once she trusts you. She’s a PURRING machine and she loves ATTENTION. Poppy will need time to adjust to a new setting, but she’s definitely worth it. We recommend a home with no young children and no dogs but definitely with another cat. Poppy is sure to thrive with a buddy cat that she can hang with and learn the ropes from. Poppy is available for “Meet and Greets” in Westchester, NY. She is spayed, UTD on shots, and FIV/FeLV negative.